State Sens. 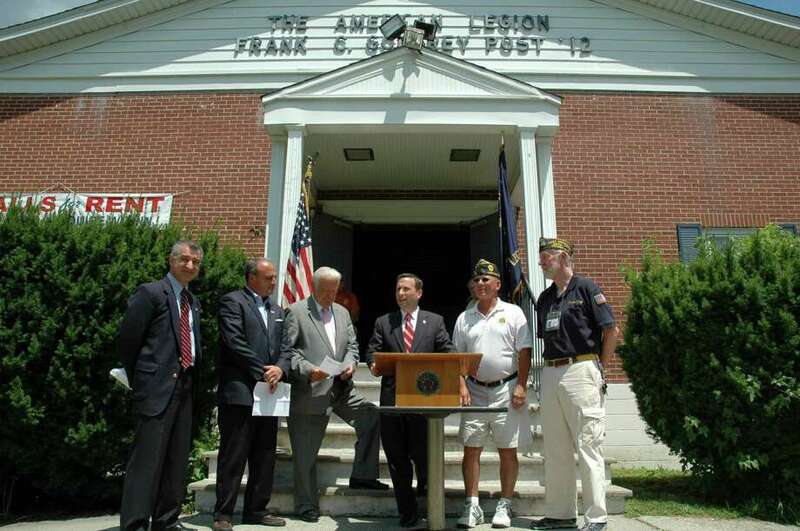 Bob Duff (D-Norwalk) and Carlo Leone (D-Stamford) visited the American Legion Post 12 ahead of Independence Day Tuesday to thank veterans for their service and to highlight new legislation to benefit military men and women who fought for their country. This year, Duff and Leone championed and won passage of important bills that will help to improve the lives of veterans who live in the state of Connecticut. The legislation ranges from a jobs program that provides financial incentives for hiring returning combat veterans to a bill that makes it a crime to desecrate a memorial honoring veterans. Joining Duff and Leone at the event were House Minority Leader Larry Cafero (R-Norwalk) and Norwalk Mayor Richard Moccia as well as American Legion Post 12 Commander Buddy Scudder, Norwalk Veterans Memorial Committee Chairman Dan Caporale, Phillip Kraft, president of the National Veterans Service Fund, headquartered in Darien, and other veterans. "This Independence Day, as we reflect on our freedom, it is important to honor and thank those who put their lives on the line to serve their country," Duff said. "Every year, we in the Senate take up legislation that shows our gratitude to veterans by helping improve their lives, sometimes in small ways, sometimes in big ways. I am particularly proud of this year's achievement -- a program to help returning combat veterans from Iraq and Afghanistan find jobs." "Just as our veterans did their duty to protect our country, it is now our responsibility to care for our veterans. The STEP UP job training program will be a great help to the many soldiers now returning home from Afghanistan and Iraq. Since readjusting to civilian life is not always easy, we also passed a bill this year to grant nonviolent veteran offenders a second chance in the judicial system. As we celebrate our freedoms on the Fourth of July, we must remember and honor the sacrifices of our men and women in uniform," said Leone, who serves as Senate chairman of the Veterans' Affairs Committee. "When it comes to veterans issues, you won't see any partisan politics come into play in Hartford. We worked together to pass legislation that will benefit the brave men and women who served their country," Cafero said. "I'm very appreciative of the bipartisan nature of our delegation who have worked together to assist our veterans," Moccia said. "Now from the city's end, we must work to get the word out to residents about these veterans' programs. We will make information about this legislation available on the city's website." "As a Vietnam era veteran, I understand the problems so many combat veterans faced when they come home -- especially the way they were treated," said Scudder, Commander of American Legion Post 12 . "There was no job training program back then, but now there is, and it will be a great step for getting our new veterans acclimated to civilian life. Many veterans have an education, but there are still few jobs out there for them. New training will help. As a veteran, I am privileged to live in a state and a town that understands the value of supporting our troops, and honoring our veterans." A "STEP-UP for Veterans" Program to specifically help unemployed post 9/11 veterans, who suffer from an unemployment rate as high as 30 percent. This initiative subsidizes the cost of hiring and training a new veteran employee at a gradually declining rate over six months. Unlike the existing STEP UP program for non-veterans, only post 9/11 combat veterans who served in Iraq or Afghanistan are eligible for this new subsidy, and companies of any size may participate. The bill authorizes $10 million in bonds for the program over two years. A Pretrial Diversion Program that will allow former members of the armed forces who have committed specific nonviolent offenses an opportunity to participate in pretrial diversionary programs twice, rather than only once. The law broadens veterans' eligibility for the state's diversionary program for people with psychiatric disabilities and the pretrial drug education program. Veterans would also be afforded access to state and federal Department of Veterans' Affairs (DVA) services as an alternative to services from the state Department of Mental Health and Addiction Services (DMHAS). A law that codifies two new crimes concerning desecration of war or veterans memorials: 1. Interference with a war or veterans' memorial or monument, defined as intentionally defacing, mutilating, destroying, or removing a memorial. And 2. Unlawfully possessing, purchasing or selling a war or memorial while knowing that it has been unlawfully removed from its official location. The bill imposes a $5,000 fine on anyone guilty of either crime. Both crimes are also designated a class D felony, punishable by up to five years in prison. A law that went into effect late last summer allows permanently disabled military veterans to get a free lifetime pass to Connecticut state parks. This is a simple way to say "thank you" to the brave military men and women who sacrificed so much for our freedom. Use the DEEP website to find locations to obtain a Disabled Veterans Pass (proof of residency and service connected disability status required). Fairer Taxes for Afghanistan Veterans -- A law that now requires cities and towns to waive the interest on property taxes owed by soldiers serving in Afghanistan. Armed forces members serving in other parts of the Middle East are also eligible for this waiver on property tax interest. Helping Veterans Prove Their Service -- A law allowing the state DMV to include a veteran's status on his or her state driver's license or identity card. Both of these IDs are routinely carried everywhere and widely recognized as official, thereby helping veterans secure the cost-saving benefits they are rightly entitled to. Overdue Diplomas for Korean War Veterans -- The legislature expanded a local school board's authority to award high school diplomas to veterans who did not receive them because they left high school for Korean War military service. It's a long-overdue recognition that is well-deserved. Unfortunately, that was not the case for our Korean War veterans -- until 2011. There has been a long-standing state law that awards high school diplomas to World War II veterans who had to leave high school to fight for our country.